Summer is in full swing and that means one thing: I’m a grilling machine! I just love using my grill all summer long. Grilled food just tastes so gosh darn good. And if I’m being completely honest, grilling outside usually means less dishes and less kitchen clean up for me. In addition, my house doesn’t get nearly as hot as it would if I was cooking every single meal inside on the stovetop or in the oven. These are all reasons that I can totally get behind. And they motivate me to try and come up with as many different grilled dishes as possible. Last year, I had fun experimenting with foods that aren’t “typically” grilled. I made salads, fiery salsas and heck, I even grilled up some watermelon! This year, strawberries were one of the foods on my list of potential grill-ables to try. And given that it’s peak strawberry season right now, I figured it was the perfect time to cross that item off my bucket list. This Grilled Strawberry and Cucumber Salad is familiar in a lot of ways. The addition of strawberries, walnuts and blue cheese to a mixed green salad is nothing new. But with a few simple tweaks, this traditional salad transforms into something sparkly and new. First, I grilled both the strawberries and the cucumber slices, which softens them, makes them juicier and brings out all their great flavors. Then I took a cue from Heidi at FoodieCrush and added some tarragon and basil to the dressing, which really enhances the overall freshness of this dish. And finally, because I was feeling all fancy that day, I left the strawberries on the skewers for serving, which makes for a really pretty presentation. 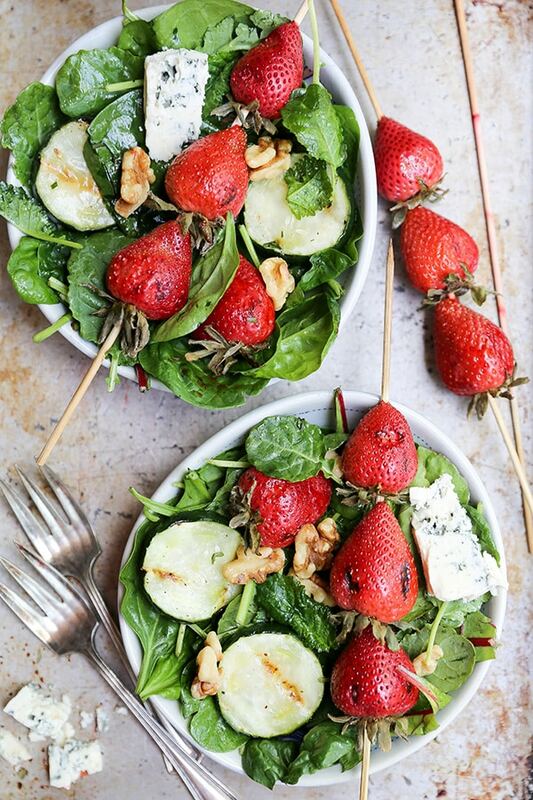 That being said, you can certainly remove the strawberries first before adding them to the salad if you’re not keen on the idea of messing around with the skewers while your eating. I just thought it looked impressive, so I couldn’t resist presenting the salad in this way. And it’s a great option to keep in mind if you’re serving this salad to guests. If blue cheese isn’t your thing, you can certainly substitute it with a few crumbles of goat cheese or feta cheese. And for a vegan option, skip the cheese all together and try adding some sliced avocado for creaminess. Grilled strawberries and cucumbers transform a typical mixed green salad into an exciting side dish that you’ll enjoy all summer long! In a small bowl, whisk together all of the ingredients for the dressing until well combined. Set aside. Meanwhile, pre-heat both sides of your grill to medium-high. Trim and discard the green tops from the strawberries, then thread the strawberries onto wooden skewers. Brush the strawberries with some of the dressing so they are lightly coated on all sides, then brush some of the dressing onto both sides of the cucumber slices. Turn one side of your grill off. Add the strawberry skewers to the side that is now “off” and grill the strawberries over indirect heat for 10 minutes, rotating the skewers once halfway through the cooking time. The strawberries will be slightly soft and have a few grill marks on their surface. Add the cucumber slices to the side of the grill that is still “on” and grill over direct heat for 1-2 minutes per side, until slightly softened and starting to form a few grill marks. 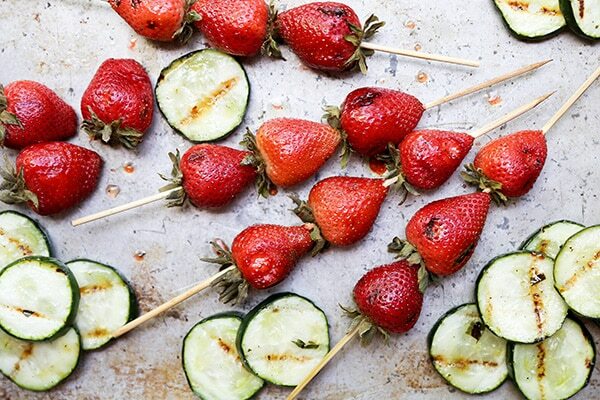 Remove the strawberry skewers and the cucumber slices from the grill, transferring them to a clean plate to cool. Toss the mixed greens with the dressing, using an amount that suits your taste preferences. Add the walnuts and grilled cucumber slices, tossing gently to combine. Divide the salad between four bowls or plates. Top with the grilled strawberries (you can remove them from the skewers first, or leave them on for a nice presentation) and a wedge of blue cheese. Serve immediately.